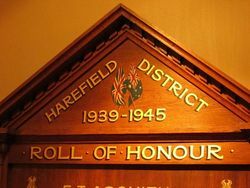 Harefield District Honour Roll commemorates those who served in World War Two. In the grounds of the Harefield Hall, gaily decorated with bunting and flying the Union Jack and Australian flags, the people of the district gathered a few days ago to welcome home service personnel. There were many visitors from Wagga, Junee, Illabo and other districts, who were glad of the opportunity to add a word of greeting and to talk with the boys as well as renew old acquaintances, while a number spent a pleasant afternoon on the tennis courts. 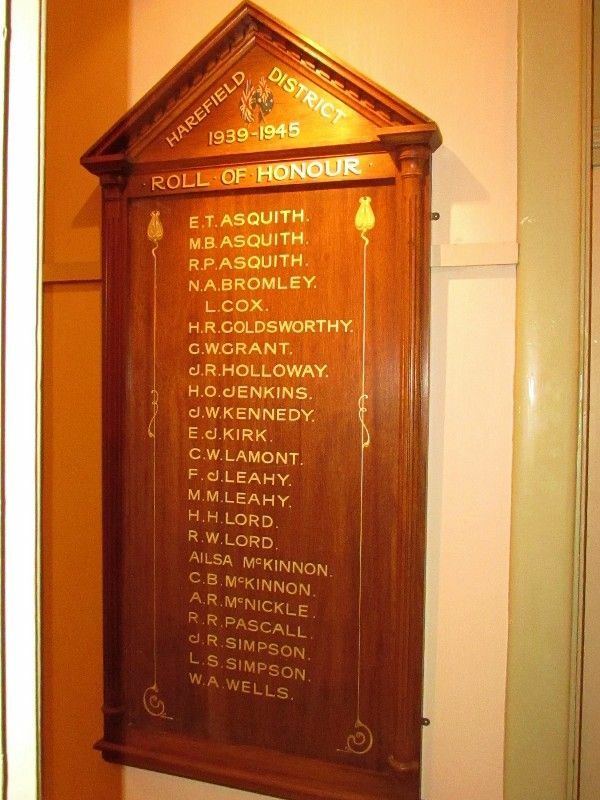 During afternoon tea, proceedings were in the hands of Mr. A. H. Goldsworthy, as chairman. After the Loyal toast had been proposed by Mr. C. C. Moss, Mr. W. O. McPherson asked all to stand for one minute's silence in honor of fallen comrades. Mr. Goldsworthy then asked Mrs. C. A. Lamont to make the presentations. These were in the form of an address of welcome containing each individual's name and rank; also a replica of the honor roll placed in a souvenir wallet. In an impressive ceremony the Honor Roll and crossed flags were unveiled by Mr. W. R. McNickle, the Honor Roll being a replica in design of the existing 1914-18 roll. Daily Advertiser (Wagga Wagga, NSW), 3 May 1946.